Taking strict action, the Coast Guard on Monday sacked the commanding officer of its warship which collided with a fishing trawler killing five fishermen off the coast of Goa on Thursday. The Coast Guard decided to sack the Deputy Inspector General-rank officer for his role in the collision in which five fishermen have been killed, Defence Ministry sources told PTI in New Delhi. 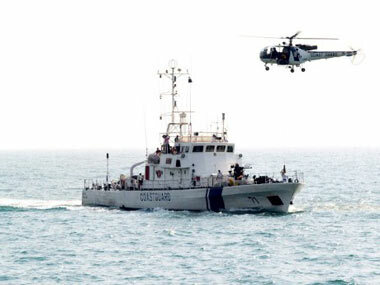 Five fishermen were killed after ‘ICGS Vaibhav’ collided with fishing trawler ‘Sea Messiah’ off south Goa-Karwar coast. By taking such a strong action, the maritime force wants to convey a message to its officials that it would not tolerate any carelessness on part of its officers while handling such important command appointments, the sources said. A Board of Inquiry headed by a DIG-rank officer is already underway to fix responsibilities in to the incident. The brand new ship was on a sea sortie and is yet to be commissioned into the force. The sources said the Coast Guard officials realised that the collision with the fishing trawler had occurred after they returned to the coast. The vessel built by the Goa Shipyard Limited was to be formally commissioned by Defence Minister AK Antony on 11 May but it is learnt that the Coast Guard function is likely to be cancelled, Navy officials from Goa said.